Clare Ann Matz - CAM Art Co. Journalist , writer, performance artist, singer, painter and video-maker Clare Ann Matz was born in New York City and has lived and worked in Italy since the early 80s. She hosted television programs for VideoMusic Italy and SuperChanel London from 1989 to 1995, she presented the 1989 Festival di San Remo for RAI 1 International and directed in 2000-2002 programs for Italia1 and Canale 5. Was winner of the 1° prize RAI at the Filmaker Festival in Milano with “Relax Girl, No voglio uccidere” (1982) and 1° prize “Città di Commacchio” at the Palazzo dei Diamanti of Ferrara with “Energy” (1984) . In New York she worked with the Japanese Butoh group Poppo. She collaborated with theater groups such as Teatro della Valdoca 1997-1998 and Kripton 1988-1989 in European tours. She was performance artist at the Festival Kassel Documenta 8 and at the Biennale in Venice in 1999 with the Progetto Oreste and again in 2006 with the project Le Città invisibili di Italo Calvino. She has worked with The C.A.M. Art Co. on the production of “The Lonely Ballet of Radio Active Leaks” and “Energy” dedicated to fluxus artist Joe Jones, with dancer Evelyna Dann. (Asolo Festival 2006). “The Black Sun of Ciguri” (1997-2002). 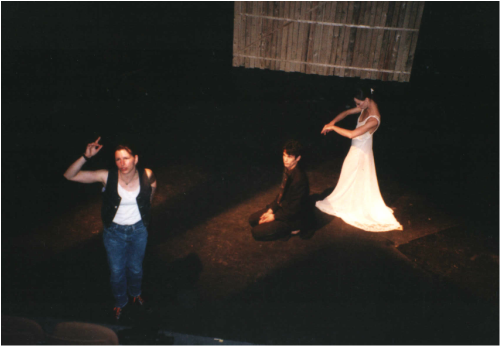 “The City of the Sun” for the Teatru Dramatycznego Bialistok, Poland (1996). “Visions” for Micha Van Hoecke dance festival in Castiglioncello, Italy Castello Pascuini. “Columbus the Moor” for the Valladolid Theatre Festival, Spain. Presented at the Calderon de La Barca Theatreand and then at the Museum of Modern Art of Las Vegas,USA (1992). “La Danza delle Anime” a poetic soundtrack for Marco Nereo Rotelli’s exhibition at La Rotonda della Besana in Milan (2010). Currently she is creating the visuals for a multimedia opera “B Cell” to be presented throughout Europe. She has collaborated on various musical CDs among which “Alisee” RDC records with Francesco Rampichini (1993), “Heaven &Earth magic feature” Mantric Wave productions with Raffaele Serra (1994), “Luis Rizzo il barrio” Materiali Sonori (1995), “Some Secrets” with her own songs Materiali Sonori (1996), “Viventi Inimitabili” with Cataldo Meo (1999), “Spledidum Vitium” with Cataldo Meo (2001) and performed live in various concerts in Italy and the U.S.A.
Clare Ann Matz has collaborated with monthly magazines such as “Caffè del Teatro” (1999-2003), “Virus” with Francesca Alfano Miglietti (19993-1999), “New York Arts” (1997-1998) and contributed with “Re Nudo” in the Starship section with Franco Bolelli (1996) and “John Cage” with Materiali Sonori (1992).